This beautiful two storey villa has five bedrooms and four bathrooms. From the large plot of 19,544 sqm you can enjoy breathtaking views, and it is ideally situated in a private location in Lliber. This property is not only a family dream home; it is also a great investment opportunity. On the main floor of the villa you find a spacious living/dining room with a free standing wood burner. From the living room you access a covered terrace and from here you can enjoy fantastic views of the Jalon valley and surrounding mountains. Just imagine sitting there when you have your morning coffee or a glass of wine watching the sunsets. On the main level there is also a master bedroom with en-suite bathroom. Two more double bedrooms with build in wardrobes that share a family shower room. On the lower floor you find another good size kitchen, living/dining room, two double bedrooms with en-suite bathrooms. There is also a large storage room with a separate entrance. This property is not only a great family dream home, for those with vision it is also a great investment opportunity. 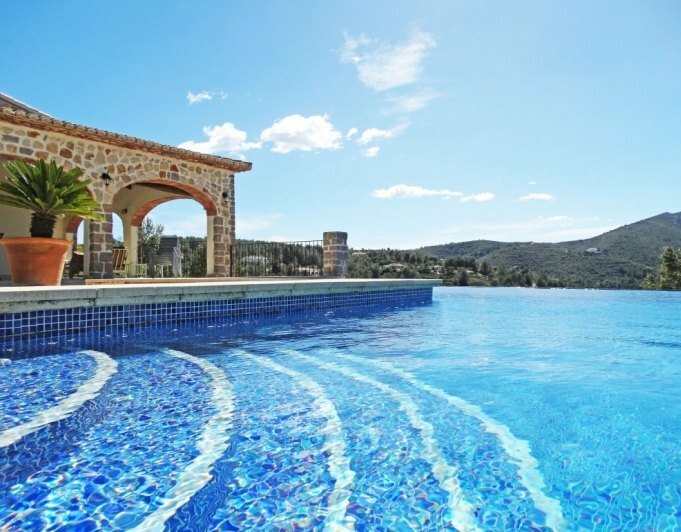 The villa comes with a fantastic rental potential. It could rent out upstairs or downstairs. It could also be two separate dwellings providing a home and income, or could easily be made into bed and breakfast. The property is self-sufficient with solar panels saving you thousands of Euros a year; it even has a backup generator for rainy days. The property also benefits from oil fired central heating, double glazing and wood burner.